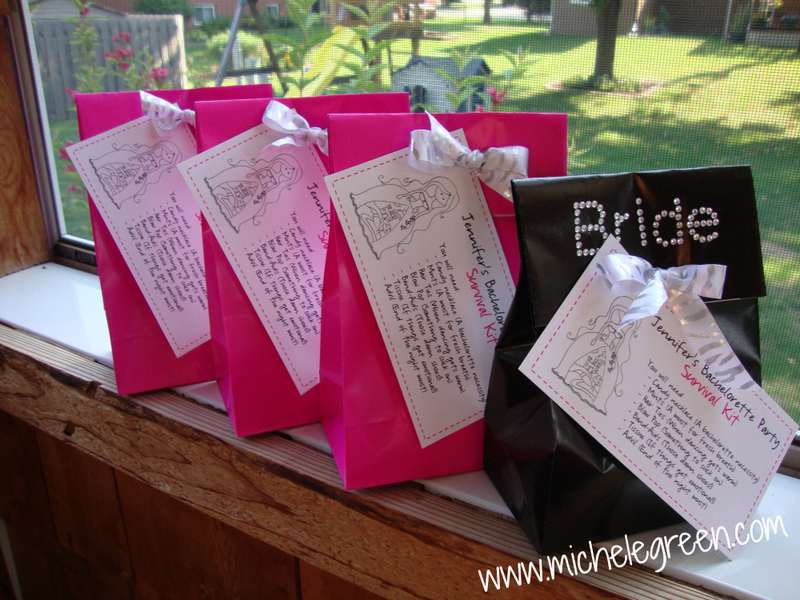 This past week I had the joy of preparing the party favors for a friend's bachelorette party. I was so excited to do this! I love to be creative when other people will be on the receiving end of my projects. Today I am going to share with you the Bachelorette Survival Kits I made for us girls and later this week the bachelorette sash I made her! Both were super fun projects! I used paper sacks, folded over the top, punched holes and used silver zebra ribbon to tie it together with the tag I made up. The bride-to-be had special bling from the Dollar Bin at Michael's. Inside there were a bunch of little treats to get the girls through the night. The tag on the front explained why each item was included in the bag. 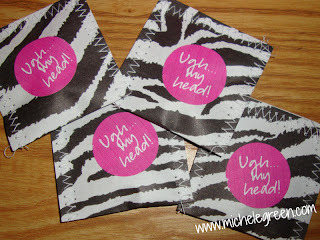 A close-up of the Advil packets. I folded a 4x2 piece of paper in half and sewed the edges shut. This leaves one side for easy tearing when the end of the night comes and you need some Advil! The pink stickers I created by printing them on a full sheet label and then using a 1" circle punch. I gathered inspiration for these bags from SincerelyKristi, Miss Jillian Designs, and here. Adorable! Such a great idea to make survival bags and tag explaining each of the items. I bet they were loved by all. This is so much fun! I love these! !